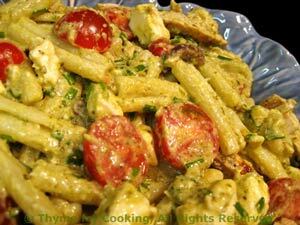 Thyme for Cooking easy recipes: Chicken Pesto Pasta Salad. Our final use for pesto this week. This is not the prettiest salad, pesto usually isn't... But the taste is wonderful: the feta and Greek Olives adding just the right amount of contrast to the chicken and pasta. Mix Worcestershire, vinegar, basil and oil in a small bowl. Pour over chicken and allow to marinate a few minutes. Pit olives, if needed, and cut in half or thirds. Cook chicken, either on barbecue grill or nonstick skillet, 7 - 10 minutes per side, or until done. When done, remove and slice. In pasta bowl, mix pesto, oil and yogurt. When pasta is done drain, rinse lightly with cool water, drain well and add to pesto in bowl. Toss to coat. 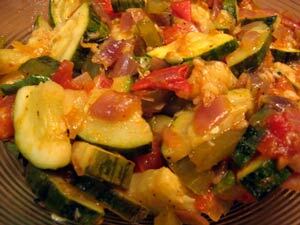 Add chicken, tomatoes, olives, feta and chives, toss gently to combine and serve. You can serve cold, with a drizzle of Balsamic vinegar, or gently reheat.